Ocean view/beachfront with balcony on its own private beach (Fort Lauderdale), Very well furnished, 2 queen bed, 1 ottoman convertible bed, table with 4 chairs, coffee maker, microwave, refrigerator, hair dryer and complementary amenities, including towels, shampoo and conditioner, soap, mineral water, coffee and sweet things are provided for your enjoy. The place has a large heated pool, tiki sports bar/ restaurant, pool cabanas available, new five star Italian Restaurant, beauty salon, and much more. 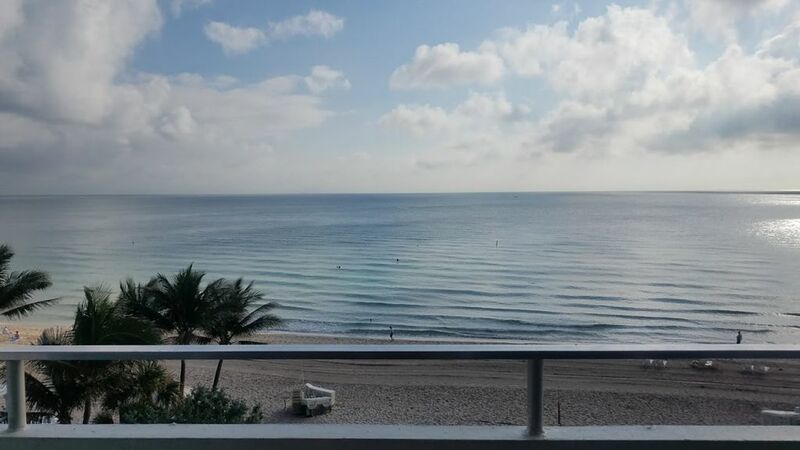 The unit has a fantastic ocean view balcony were you can enjoy a beautiful sunrise or rest in the afternoon from a busy and sunny beach day. Walking distance to many shopping plazas, restaurants and entertainment. Valet or self parking $10 per day unlimited in and out, umbrellas and lounges available for rent from hotel, no charge for pool lounges. Coffee shop in lobby 24/7. Also you can enjoy with the local activities, such as local free trolley, jets skis, paddleboards, kayaks, bike rentals, dive shops, water taxi, sports bars, nightlife entertainment, fishing pier, deep-see fishing and parasailing, just to mention some. Notice: for those who want to rent during spring break, this is from March until mid of April, be aware that building is going to be with spring breakers. The room was fantastic and had a beautiful view. The balcony and location was exceptional! The owner was very responsive and took great care of us. The only issue was the laundry wasn't in the room and since I had kids I wasn't able to utilize it. Could not have been better. Perfectly located overlooking the beach. The unit was clean and beds very comfortable. All the linens etc., were top quality. Each morning we had coffee (supplied) in the room. Went down to the lobby for a muffin. Headed out to the beach. We opted for chairs and umbrella($). Lunch at the tiki bar, was excellent and the staff very friendly. More sunning, then walk down to the beach to Lauderdale by the Sea for dinner and drinks. Our intent was to relax on the beach (and see the Bruins play the Panthers) and we nailed it. Thank you Ayelen for making it easy. Exceptional unit! Have stayed at Ocean Manor in the past and this unit was by far my favorite. It was bright and welcoming, supplied with everything you will need. The owners gave us personal attention to a few of our needs...so helpful and we are so thankful. Balcony was a plus facing the ocean with morning coffee and sunrise!! Thank you so much, I'm glad that you like it! You're welcome back anytime, it was a pleasure being your host. Come back soon! Great view. Clean. Everything you need for a beach vacation. Probably the best room we have stayed in at Ocean Manor. Loved the extra treats in the room. Thank you! I hope you came back soon! And thank you for being respectful with the unit and great as a guest.